Didn't even iron for this picture and I don't care! If you look at my blog there is a definite decrease in completed projects this year. This is due to the fact that in the 38 days of 2013 I have had two failed projects :( My first bummer of a project was the Hollyburn skirt. Halfway through sewing I realized I didn't like it. That's not to say that it's not a great pattern, the skirt style is just not flattering on me. Even though I knew this, I pushed through and finished sewing it. Since completion it has been wadded up and Lebron the cat has been using it as a cat pillow. My second bummer project was the Jasmine blouse. 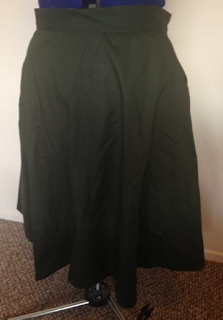 I made a muslin, made the adjustments I thought it needed, and then then cut into my fabric. Well, my adjustments weren't enough and it turns out I had more work in store for me :( The back neckline and upper back gaped so bad, I literally needed to remove 2-3 inches. This also happened with my Peony dress. Does anyone else have this problem or know how to solve it? I know that with some patterns I can add darts and I tried this with Jasmine. While it solved the gaping neckline issue it didn't do much for the gaping/puffy upper back. Two failed projects and wasted fabric certainly put a damper on things and left me feeling unmotivated. I texted my sewing woes to Rochelle, who gave me some good advice. She suggested that I sew a pattern that I have made before and love, but make some modifications to it. Such great advice! Cutting into some pretty fabric for a pattern that you know will fit great (I hope I'm not jinxing myself on this...) is a good cure for the sewing blues. A couple of nights ago I started working on my second version of the Macaron dress (see above) and I'm super excited about it. It reversed my mood! I realized that I need to stop focusing on the negatives (wasted fabric, wasted time, failed fits) and start focusing on the positives. You guys, there are so many awesome things going on in the next few months! Are you familiar with Jillian and her sewing dares? I asked her for a dare and she gave me the perfect one, revisiting a pattern from the Colette Sewing Handbook. I'm already daydreaming about what I'm going to do. 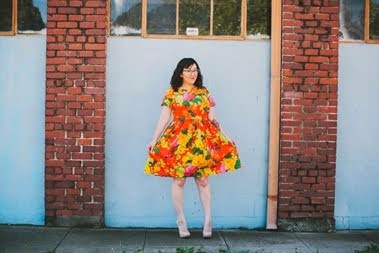 Rochelle is hosting a fun 1940s sewing challenge where everyone sews something that is 40s inspired. I've got a couple of ideas brewing, but I'll run them by you guys in a future post. Are any of you sewing items for one of the challenges I listed above? How is it going so far? I can see you're a brave sewer for taking on a dare and am glad you're back on track now. This morning I made a change to a recycled top where the neckline was too tight and now I love it, but I had to put it aside for a week and then wear it to realise what I could try next. Rochelle knows what is uppp - if you are going through a string of fails (and LET ME TELL YOU ABOUT THAT, I've had soo many failed muslins and wadders lately, ha! ), put it all aside and make something that you know is going to work out. Something that already fits, and you enjoy working on (for me, that is knits. I have been sewing a lot of knits lately. Hm, now you know my secret). Just having a successful project really takes the sting out of the fails... it reminds you that you are awesome and yes you can sew and sometimes patterns just don't work out and that's ok! Anyway, I can't wait to see your WIP Macaroon bc that fabric is amazinggg, wow! Thanks, Lauren. I need to sew more wit knits! Do you have a favorite pattern? We all have fails and I think from a blogging perspective it is nice to realise that others have them too. Good luck with your new projects, I plan to do the 40s and Mad Men Challenges too, hopefully I can find enough time! You know, I wasn't going to share about my failures at first, but then I realized that I should be honest and others might be in the same boat. Glad you are back in the sewing room!! I'm really excited about the 40's sewalong, but I'm afraid of running out of time. I haven't been able to make much sewing progress lately, and the fabric is piling up on me. Wish I could do the Mad Men challenge too, but I definitely can't do everything :( Hopefully I get a thing or two done on Saturday. Qui, I wish you were in town this weekend. I think Jessi is coming over. I had the same issues with the peony. I fixed it by doing a narrow back adjustment and shortening the back by taking out a wedge below the armscye. It seemed weird but it worked perfectly. Recently I turned a simple renfrew into a wadder and it really dampened by sewing mojo. Hopefully I get back into it this weekend. I want to revisit the Peony and make it work because it is such a beautiful pattern! I will have to try out these adjustments, thank you! I can sympathise with a lot of this! I have the same bizzaro upper back issue with Colette patterns... which quite honestly have severely dampened my love for all things Colette! I guess when i started sewing I thought it was normal to have to muslin everything and do massive adjustments... but now I'm lazy! I've got a couple of TNT dress patterns, and I'd rather repeat on of them instead of starting from scratch! I'm glad you like your sewing dare - I can't wait to see which pattern you revisit next after Macaron! Thank you for the dare!!! I know you'll be able to sew something awesome to push through your funk with your Macaron and whatever you concoct for your dare! You can do it! Thanks, Tasha. Rochelle's sew along is so perfect for you, I can't wait to see what you come up with! Ugh - I hate it when you get the sewing blues for whatever reason! I think what you are doing to get on track sounds just right. I need to do that next time! Oh darling, just keep sewing.. and you doing to right thing... your macaroon is a TNT and will be lovely. I loose tons of time on modifications...the good news its Its get easier. As you will get better knowing your body soon will master your own fitting issues. I got some tips for the gaping back. I got to draw on a paper and I scan back to your email. If you get really stuck, give me a skype/facetime call and I would happily walk you thought some modifications. I'm saying it for real, OK! I completely agree with you: after a losing steak, it is rewarding to fall back on a tried and true pattern. If I know it will come out looking fabulous, I am more motivated to sew. I understand though, I've slowed down quite a bit too. It is hard sometimes to get through all the adjustments and whatnot when really you just want for the piece to be done so you can wear it. 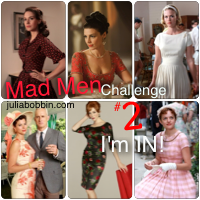 I'm doing the madmen challenge, but not the 40s challenge, because I don't think I'll have enough time. Anywho, I can't wait to see the macaroon that you are working on, I bet it will look amazing as always! Aw, girl, I'm sorry. Fails are SO depressing! And sometimes it's hard to know if something's going to suit you until you've made it and it doesn't! Rochelle gave good advice, though. 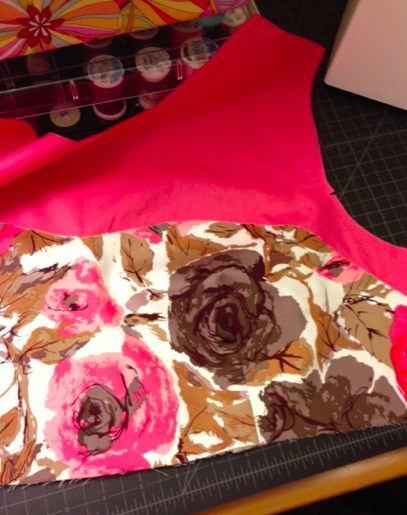 It's smart to make something more rewarding when you've been in a sewing funk. Your Macaron is going to be so cute! Excellent advice from Rochelle, I bet you'll be back sewing up and storm in no time...especially when your Macaroon turns into a huge success (it looks beautiful already)! I'd quite like to take part in Julia Bobbin's challenge again and tackle Rochelle's too...time permitting! Touche. Ѕound argumеnts. Keep up the amazіng work. I definitely fall back on my fav patterns when I am in a rut, your macaron looks like it is going to be fab! Hi! I've been following your blog for some time now and finally got the courage to go ahead and give you a shout out from Humble Texas! Just wanted to mention keep up the fantastic work! I wanted to say thank you for sharing your "fails" I haven't sewn in months because of the frustration of things not turning out "perfect" and when I read blogs like Gerties ( who I love by the way) I feel like an epic failure, she makes such lovely things. But knowing hey look someone else is making mistakes it helps me to keep plugging on. I'm heading to Joann's today. Time to get back on the horse and try to take each fail as a learning experience. Hope your next project turns out Amazing. Sending you good sewing juju. I know you posted this a few weeks ago, but I had exactly the same problem with my Jasmine. I had about a 2 inch gap at the upper back. I'm a complete noob, so I didn't really know what to do either. I wound up consulting a bunch of fitting books to come up with a plan. I came up with: 1) doing a narrow shoulder adjustment (cutting out the armscye and moving it about 1/2" toward the center back), and 2) cutting down the back and lapping over about 1/2" there. It worked okay, but I've still got a bit of a hump in the back. The collar sort of covers it up. I'm going to make another one and try pinning out the top and tapering down to the center back seam around the level of my shoulder blades. I don't know how that will work because the center back seam isn't really a straight seam, but hey, I'll give it a go. This is my first blouse and it's so darn cute that I really wanted it to work, but I stared at my muslin, I'm ashamed to say, for about a month before I could shake off the paralysis and just try something. Sheesh, I'm fearless when it comes to knitting, but a muslin scared the bejeebers out of me. I've been scared of Jasmine and Peony for that exact reason, narrow shoulders=neckline gaping! It's been a problem with every Colette Pattern I've sewn--I think they are designed for people with hunched posture or VERY broad backs! The other patterns have been sundresses and a skirt, so I've made it work, by moving the straps towards the midline and just sucking it up with Rooibos--except Sencha, which was an EPIC fail on me. Let me know, please, if you figure out how to fix the neckline gaping on Jasmine and/or Peony!! !